Although the United States remains the world’s most affluent nation, it also is a country where money plays a driving, negative role in its people’s well-being. Sudden financial losses may shorten some Americans’ lives, while dismal finances may keep many others from seeking medical care. So why are politicians still pushing to slash the nation’s social safety net, even as millions of individuals and families are voting with their wallets to protect their health? It may have seemed like urban legend. But new research, based on federal data following almost 9,000 Americans ages 51 to 61 for two years, shows that those who suffer major financial blows had a 50 percent higher risk of dying in the years soon after. Researchers found this increased mortality — an observed association and not a direct cause-and-effect— by focusing on the 1 in 4 members of their study group who lost 75 percent or more of their net worth, an average decline of $100,000. Although such sums may seem large, they may not be so rare, given the tens of millions of Americans who are staggered by job losses, home foreclosures, steep declines in retirement and other investment accounts, and bankruptcy in the Great Recession. 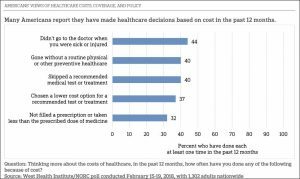 Medical bills and debt remain a major bane for tens of millions of Americans, including 21 percent of respondents to a recent nationwide survey who said they were uninsured and hard-pressed to pay $10,000 or more they owed for medical treatment. Indeed, the “wealth shock” findings were reported just as other experts made public their survey results showing that between a third and a half of people age 45 to 59 and a quarter of those 60-plus went without needed health care in the last year due to its cost. The results were unhappy, too, for those 60 and older, an age group in which many also skipped medical care or procedures due to financial worry, though these were less due to Medicaid and Medicare. Younger respondents were more likely than seniors to skip medical services due to cost concerns because their finances were less stable, and they lacked support from government social programs. 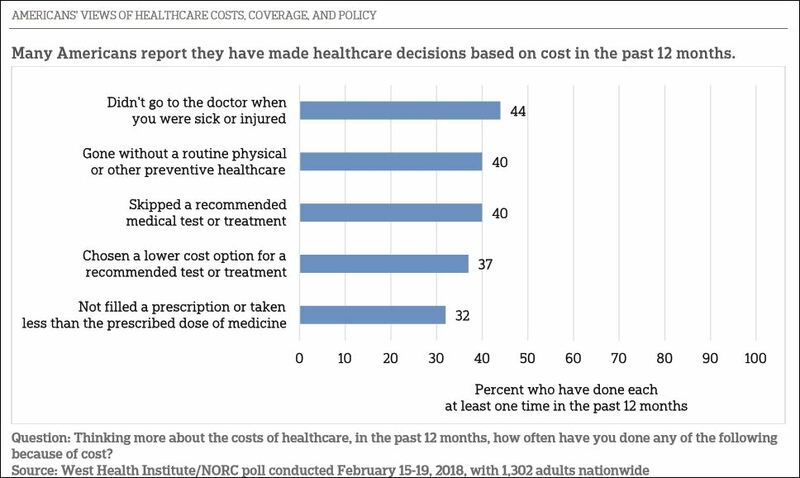 In my practice, I see not only the huge harms that patients suffer while seeking medical services but also their tragic struggles to access and afford safe, quality medical care — often for long periods due to injuries inflicted on them by others, notably doctors and hospitals. It’s unacceptable that in a country as wealthy as ours, so many suffer Americans with bad or nonexistent medical care and perpetual worry and sorrow over how to pay for the little medical treatment they can get but can’t afford. The federal government has announced that in 2017, even as the Trump Administration and Republicans in Congress tore at the health insurance offered to poor and middle-class Americans under the Affordable Care Act, almost 12 million individuals and families enrolled in Obamacare. That’s 400,000 fewer people with ACA coverage than before. But the numbers stayed solid, even as Trump officials slashed the budget to get Americans enrolled in Obamacare and the time in which they could sign up. In the face of steady and robust support for this public health insurance option, Trump and the GOP continue their attacks on the ACA, including by repealing the individual mandate (the requirement that Americans show at tax time that they had health coverage) and encouraging the proliferation of skinny and bad health insurance options. These moves, a new analysis reported, will lead to 6.4 million fewer Americans with health insurance, while the federal bill for coverage rises by some $33 billion per year. It also will push premiums in the individual market to rise by an average of more than 18 percent.